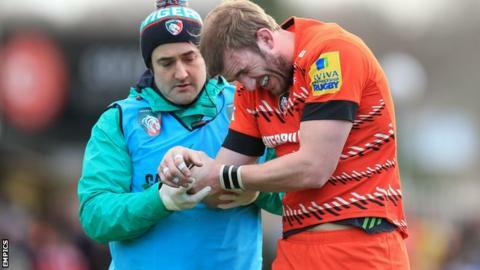 Leicester Tigers flanker Tom Croft, who has been sidelined since March with a dislocated shoulder, has been training with England. Stuart Lancaster's side are preparing for their World Cup warm-up game in France on Saturday. Tigers boss Richard Cockerill told BBC Radio Leicester: "Croft's good and is training with England this week. "This is just to get himself up to speed with what they are doing, in case there are any problems there." Croft has not played competitive rugby since he had surgery after dislocating a shoulder during the Tigers' win over Newcastle Falcons. The 29-year-old suffered a broken neck in 2012 and missed much of the 2013-14 campaign because of a knee injury.